And will you succeed? Yes! You will, indeed! 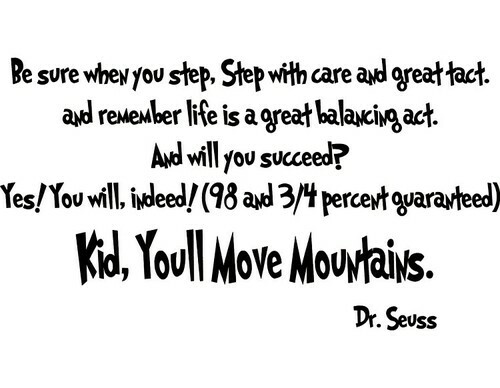 (98 and ¾ percent guaranteed) Kid, you'll move mountains. And remember that life's A Great Balancing Act. This is a quote from one of my favourite books to read with my boys. It provides a great message for them and often makes me take stock of my life. I always have a very hectic life, and often I find myself spinning too many plates. I reached that point last year, after running up my agency (We Do Code) for around 12 months. I could feel myself sinking. Not a good feeling! I was spending far too much time working, because of this I could see a distance growing between my family and I. It was the little things that I was missing out on, bedtime, cuddles, time with my wife and children in general. As I was doing everything, as soon as one thing didn't go quite to plan I would suddenly be working to the wee small hours. The most common being that if I went out for a sales meeting, I would have to then do any development work that night, which then meant any bookkeeping I would normally do in the evening would be done at 3-4am, before being up again at 8am for another day of dev/sales/bookkeeping/account management. It was not long after Christmas, where a client had called throughout about nothing critical, and I was sat reading "Oh, The Places You'll Go" with my eldest, that I decided enough was enough, and that week I went out for 5 interviews including 2 on my birthday, and by the end of my birthday I had 4 job offers on the table. One of which was with Building Blocks, where I am now, and it is the best move I have ever made. The work is interesting, my colleagues are great, and I have my work life balance back. Yes I am still spinning plates, but they are generally much more manageable now, and don't forget "Kid, you'll move mountains!"